There are one or two apps which allow you to ‘plant’ virtual objects in a location allowing others to pick them up later on (Pinterest for location anyone?). Everplaces literally just launched, Stikinotes and Pinwheel have yet to launch. 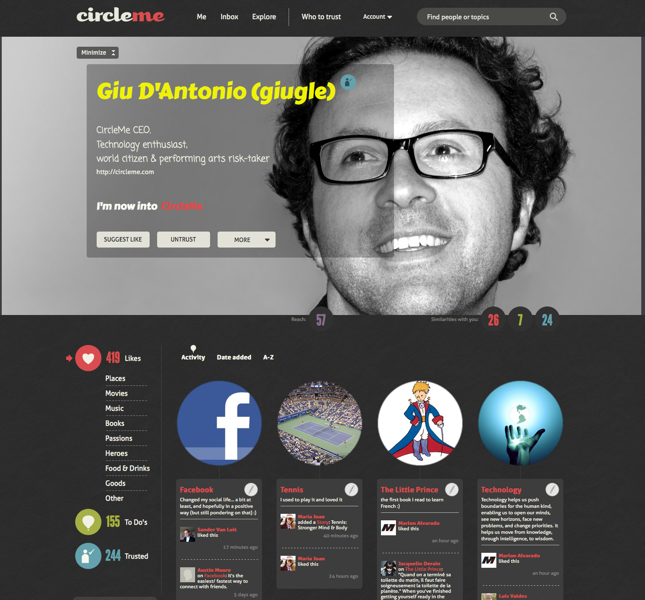 But CircleMe comes out of a six months closed beta today to try and prove it’s different than the others. Launching with a website, an iPhone app and $2.5 million in funding from VC firm Innogest Capital, this social network lets users geo-tag a city to trigger alerts when you are near something you’ve said you already like on another social network. Users “plant” a song, a book, a movie, a venue, a famous person, you name it, along with an associated message for others to enjoy. CircleMe has also pre-populated the database with close to 1 million items to “like”, and another 11 million to access via API connections with other networks. They just want you to put all these things on a map. Other users then explore what’s been planted around them, or get automatically alerted when they walk by a ‘plant’ from someone in their trusted network. It sounds a lot like the way Highlight and Glancee work for people, but CircleMe is about things. CircleMe’s founder and Executive Chairman, Erik Lumer thinks being able to discover the things people like in the real world is better than other kinds of sharing. We’ll see. What I don’t think any of these apps quite address is what happens if the thing attached to the location MOVES, like a show closing at a theatre. Whatever the case, the team looks strong. Lumer is a former researcher with Xerox Parc and Stanford University turned serial entrepreneur, and a former co-founder and CEO of Babelgum. Giuseppe D’Antonio, CEO, has been with Google, Dada and Manhattan Associates. D’Antonio says CircleMe is similar to Pinterest but is “not just image collection, but the collection of ‘passions’ that you can do on CircleMe has ‘smarts’ behind it that lets you find out about similar items to the ones you like and much more content related to these interests (articles, audio, video, etc…).” You can be the judge of that. The company has a staff of 11, with offices in London and Milan.